A fork of WAILA by ProfMobius. This fork is permitted under the CC BY-NC-SA 4.0 license. I intend to update this fork quickly and often. All plugins/addons/compatibilities created with the official mod are 100% compatible with this fork. You can find a list of most changes right here. By default, Numpad 3 and Numpad 4 can be used to lookup the recipe of blocks in the world in JEI. This requires JEI to be installed to function. You can change the colors and text formatting of the tooltip in-game by navigating to the in-game config, opening the "Waila" options screen, and selecting "Format content...". If you are having issues with tooltip handlers added by mods, you can run "/dumphandlers" which will produce a text file with all registered handlers and what types they are registered to. As of 1.12, the Narrator can be toggled for the tooltip. This will use the system's text-to-speech library to tell you what you're looking at. If you feel that having the item being displayed in the tooltip is redundant, it can be disabled. can you make it say anywhere on the page whether it works for mobs or not? I would like to customize the gradient border, but I dont know if it's this mod... if it is I cant find it in the options =P is there a way to change the gradient border? On 1.12 and before, it can be edited in the in-game config GUI. In 1.13+, you need to add a theme to the config JSON and select it in the in-game config GUI.. I'm still not understanding, sorry... (this is the first time I actually tried to change the theme) how do I do this? Terrible comment. If you want a great comment, read this comment. I can't seem to get the tooltip to stay permanently. Every time I change to setting to always on, it reverts after I close the configuration menu. Edit: Ignore this comment, I had one of the setting wrong. I apologize. So this isn't allowed in Technic packs, then? I think he wants to help and contribute to a forge version so you can concentrate on the fabric versions. You do know that nobody thinks this is funny, right? 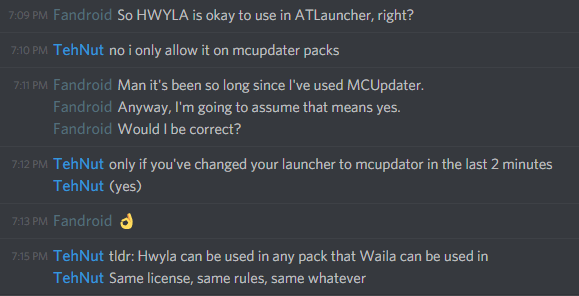 Did you not learn that from Wawla? How is this mod 1.14 also? Does it use Rift or is it a complete standalone? If you look at the file dependencies and file name, you can see it uses Fabric. Thank you so much! Sorry for asking a noob question, I was unsure. :x Ty tho! How can I see the progression percentage when I'm breaking a block? Find an add-on that includes that feature and install it. Do you know the name of the add-on? Hi. sorry if this has been asked before, Google didn't help. Is there a way to make it so trapped chests just show up as "chests" a config or addon?